UDM Downloads > Comcast Password Recovery Tool! Retrieval application can easily retrieved all saved secret passwords including IE AutoForm and AutoComplete fields, lost FTP passwords, or forgotten user identities detail and AutoComplete passwords of various email, game and chat accounts such as EarthLink (Earth Link.net), lycose.com, game sites like zapak, Outlook express, editorial account passwords, Microsoft (MSN, Hotmail), Comcast (Comcast.net, Comcast.com), AOL (AOL.com) and Verizon (Verizon.net) etc. Professional recovery software unmask passwords characters, stored behind the asterisk marks with supporting all latest internet explorer versions like IE 4.x, IE 5.x, IE 6.x, and IE 7.x. and windows application. Universal secret codes synchronization application supports internet http, FTP and windows password protected system applications. 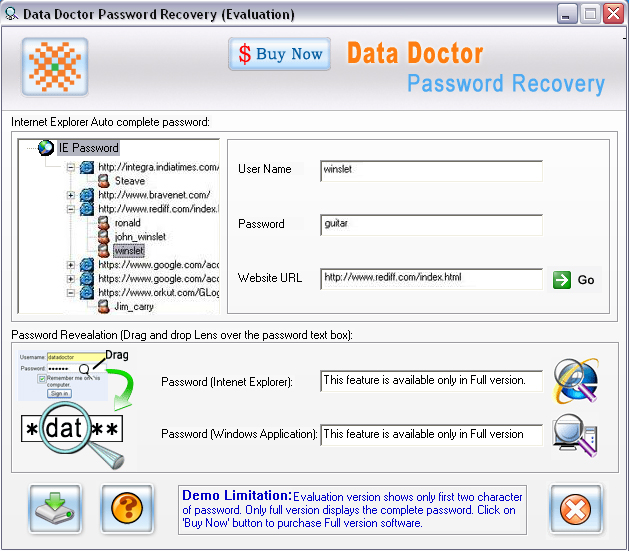 Login name ID recovery application can recover passwords characters which are stored behind asterisks [******] sign or in any other encoded or encrypted symbol. Unhide tool is able to uncover pseudo passwords characters from web sites saved by auto complete form system within a short time with this multilingual password uncover utility. Program supports all MS windows OS like Win 98, NT, ME, XP, server 2000, 2003, 2008, longhorn and Vista. Important Features: * Unmask utility supports multilingual login ID and passwords. * Help is provided round the clock to respected customers from technical experts. * Unhide password recovery program supports all internet explorer versions including latest IE7. * Restoration software has cutting-edge user-friendly graphical user interface to assist end-user. * It can work with all windows operating system such as Vista and Microsoft server 2008. * Tool retrieves internet explorer login detail and passwords hidden behind asterisk signs. * Utility recovers Webs, windows, email and FTP passwords.